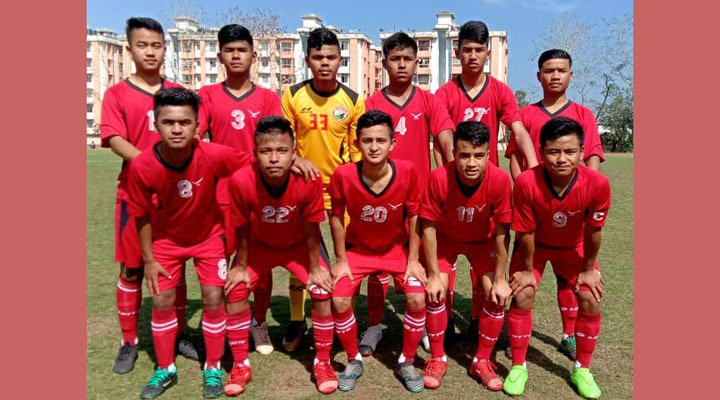 The junior team of Shillong Lajong Football Club on Wednesday had a fantastic win over NorthEast United FC by 6-0 goals in their match of the Shillong-Guwahati Zone in Hero Junior League held in Guwahati. For the Shillong Lajong team, the goals were scored by Henry Nongneng, Sangti Janai Shianglong, Batskhemlang Jyrwa, Benjamin Diengdoh, Abhay Chettri and Glennys Godfrey Lynrah. While Henry Nongneng scored the first goal of the game at 16th minute, the second goal was scored by Sangti Janai Shianglong at 22nd minute. The third goal by the Junior Reds was scored by Batskhemlang Jyrwa at 27th minute, Benjamin Diengdoh scored the next goal at 42nd minute, Abhay Chettri at 82nd minute and the sixth goal of the day’s match was scored by Glennys Godfrey Lynrah at 89th minute. On April 6, the under-12 team of Shillong Lajong FC beat PFR Football Academy by 1-0 in the finals of the U12 Chief Minister Youth Development Tournament. The match was held at the Mawlai Ground. Aibok Lawriniang of the team had scored the only goal in the 16th minute.